We have been indulging in the act of adding the glamour share into the balconies of the people. During this we have come across the fact that most people nurture a gentle love for plants and one of the most admired among them is Aloe. So here are we, to offer some wonderful ways to embrace it into yours this winter. Sometimes you might just want to transfer the healthily growing green piece of nature's art from outdoors into your living room, probably just for a change. In that case, aloe can be a good choice. 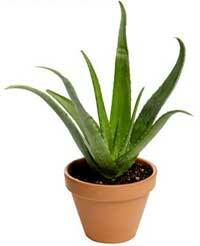 Aloes can be grown inside quite conveniently provided it gets enough light and no excess water. If you are a sheer aloe lover then you may opt for any variety as they are all striking and pleasant. However if great skin is what prompted you to go for it then you must pick Aloe vera, the stemless and succulent plant species. Aloe vera extracts are extensively used in the cosmetics and alternative medicine industries. It is widely claimed to possess rejuvenating, curative or comforting properties though there is no enough scientific evidence. As it is a succulent plant it should be potted in a fast draining condition to allow the soil to remain dry. Soggy soil can lead your Aloe plant to rot and die. If the leaves are withering then it's the indication that it's time to water them. However, it needs abundant sunlight to be happy either indoors or otherwise. A cozy warm temperature is also what your cute plant craves for. Aloes prefers temperatures above 40F. If grown inside, the chances of the Aloe plant to bloom are unlikely, however, it gives rise to tiny offshoots called "pups." When these pups get around 2 inches long they may be carefully detached from the mother plant by cutting it right at the base of the pup. The separated pup can then be planted in a fresh moist soil pot to survive almost effortlessly. So go ahead and create beauty with your love for Aloe, like us. We are of course its diehard fans as it requires minimum maintenance and possesses enormous beauty and utility quotient.